Holiday demand was strong, but results weren't enough to satisfy investors used to big beats. STAR WARS: BATTLEFRONT. IMAGE SOURCE: ELECTRONIC ARTS. Shares of video game giant Electronic Arts (NASDAQ:EA) cratered last week following the release of its fiscal-third-quarter earnings report. Although Electronic Arts' earnings exceeded analyst estimates, its revenue and outlook proved disappointing. Electronic Arts earned an adjusted $1.83 per share on revenue of $1.8 billion. Analysts had expected the company to earn just $1.81 per share on revenue of $1.81 billion. Overall, it was a strong quarter, but not as strong as many investors may have anticipated. Let's take a closer look at Electronic Arts' results. Electronic Arts' quarter was dominated by video game consoles. Sales of its Xbox and PlayStation games generated 76% of its adjusted revenue, with most of that coming from the newer Xbox One and PlayStation 4. It took two years, but it seems most gamers have finally moved on to the latest consoles. During the quarter, sales of Xbox One and PlayStation 4 titles generated two-thirds of Electronic Arts' adjusted revenue. The older PlayStation 3 and Xbox 360 brought in just 10%. That's a massive swing from last year, when it was 41% and 29%, respectively. In Western markets, Electronic Arts was the top publisher on both consoles in 2015. Electronic Arts' Madden NFL 16 was the best-selling sports title in the U.S., while FIFA 16 was the top-selling game in Europe. Electronic Arts' massively multiplayer online RPG, Star Wars: The Old Republic, saw its subscriber base rise to the highest level in three years. And Star Wars: Battlefront, Electronic Arts' highly anticipated, Star Wars-themed first-person shooter, sold more than 13 million copies into the supply chain, exceeding Electronic Arts' guidance. Almost all of Electronic Arts' segments enjoyed revenue growth on an annual basis, with the lone exception of subscriptions and advertising. Adjusted revenue from packaged goods surged 36%, while full game downloads jumped 39%. Adjusted net income rose 54%. 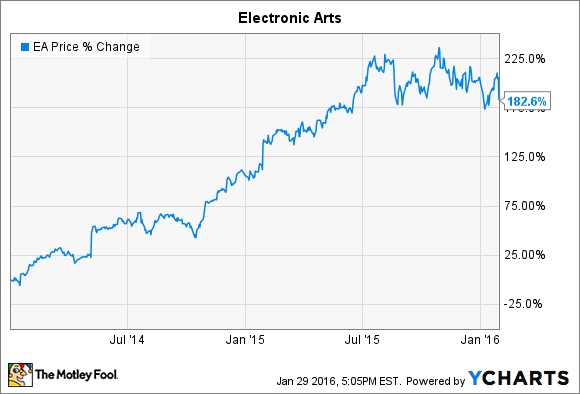 So why did Electronic Arts' shares tumble following the release of its earnings report? It may come down to recent trends and expectations. For its fiscal year 2016, which ends in March, Electronic Arts expects to earn an adjusted $3.04 on revenue of around $4.5 billion. That's slightly worse than analyst forecasts of around $3.10 on revenue of $4.56 billion. October 2015: Earned $0.65 per share on revenue of $1.146 billion, with estimates of $0.45 per share on revenue of $1.10 billion. July 2015: Earned $0.15 per share on revenue of $693 million, with estimates of $0.03 per share on revenue of $652 million. May 2015: Earned $0.39 per share on revenue of $896 million, with estimates of $0.25 per share on revenue of $850 million. January 2015: Earned $1.22 per share on revenue of $1.428 billion, with estimates of $0.92 per share on revenue of $1.29 billion. October 2014: Earned $0.73 per share on revenue of $1.220 billion, with estimates of $0.53 per share on revenue of $1.16 billion. Electronic Arts' recent earnings report still exceeded analyst estimates for earnings but missed revenue projections. Moreover, it beat earnings estimates only narrowly -- unusual given its recent history. Under CFO Blake Jorgensen, Electronic Arts has given consistently conservative guidance, which it has managed to beat handily. In its October 2014 quarter, for example, Electronic Arts earned almost 50% more than it had projected. Altogether, then, it's not surprising that Electronic Arts' shares sold off. Although the company's quarter was solid, investors simply expected more.